The CTMRA is looking for 6 runners (3 senior men, 3 senior women) to make up our team for the 2008 NACAC mountain running championships on June 15th, 2008, in Tepatitlan, Jalisco, Mexico. The 13 km uphill race will feature top mountain runners from Mexico, the USA and Canada. Accommodation and meals will be provided by the LOC. We are pursuing funding for travel, but for the moment athletes will be responsible for their own flights. Interested athletes should send a resume of their racing experience to john.lofranco@mountainrunning.ca by Friday, February 29th, 2008. The team will be announced on Monday, March 31st, 2008. Selection will be based on the road race standards (as a minimum) posted here, with an emphasis on races 10k and longer, international mountain running experience, and general trail running experience. We will endeavour to select athletes who are planning to run the Canadian championships at the Peak Challenge, and qualify for the WMRT in Sierre/Crans-Montana, Switzerland. The selection committee will consist of John Lofranco, CTMRA President; James Clampett, CTMRA Treasurer; Phil Villeneuve, CTMRA Vice-President, Eric Langhjelm, Race Director, Peak Challenge; and Thelma Wright, Cross-country coordinator, Athletics Canada. This year, the CTMRA championships and WMRT qualifying will take place at the Peak Challenge, at Mt. Seymour, BC, on July 19, 2008. You can find the race info and link to the race site on our calendar, or directly here. We are looking to add more race series to the list, so check back often. 4. At the discretion of the race director (for triathletes, orienteerers, skiiers, marathoners, injuries). 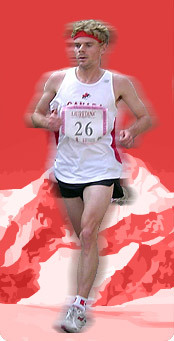 Qualification for the WMRT will be based on the results from the Canadian Mountain Running Championships/Peak Challenge. It will most likely be a straight qualifier, with one at-large spot per team for injuries/executive discretion. There will be 6 senior men and 4 senior women selected. Junior criteria will be announced at a later date. NACAC championships criteria will also be announced shortly.